My husband and I grew up showing dairy cows and raising a number of different animals. We have a young growing family and wanted an animal our young kids can handle and love. We have been fortunate to be able to have the help and support of many breeders in our area. Our small herd is growing very nicely. We have started with hand full of fancy well bred does. We have a young herd and hope they continue to grow and improve as time goes on. We hope you enjoy and love them as much as this little man. 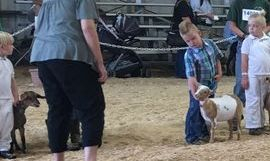 Ben and Bumble Bee pose for the judge in peewee showmanship. This is our future it is important for them to have the chance to show off what they have learned. It keeps them interested and wanting to learn more! 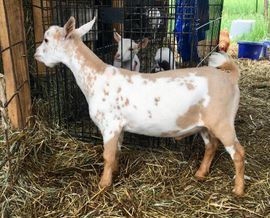 Western PA Dairy Goat Assoc.